Q:1: What is the last date of registeration? Q:11: What is the syllabus How to prepare for the entrance test? Q:13: From where I can get the sample & the past paper? The admission forms are available on the nts website NTS website . You have to download the form, fill it and send via post on the address mentioned on the form. You will get a roll number slip in the last week before the test. Last date for application submission is 14th September 2015. Test shall be conducted on 11th October 2015. For physics, chemistry and biology you have to prepare the complete books. While the syllabus of English is not well defined. There will be 20 mcqs in English portion from Antonyms , Synonyms , Grammar , Reading Comprehension. There is no syllabus for English. The questions can be from any book, any source. The time provided to solve the test ( 150 mcqs ) will be 2.5 hours i.e 150 minutes. You can easily solve test of FMDC in two & half hours provided you are prepared . The test is conducted in almost all big cities of Pakistan. Below is the list of all those cities. In case the number of students in any particular city who applied for the test is less than 200 they are asked to take the test in the nearest city. 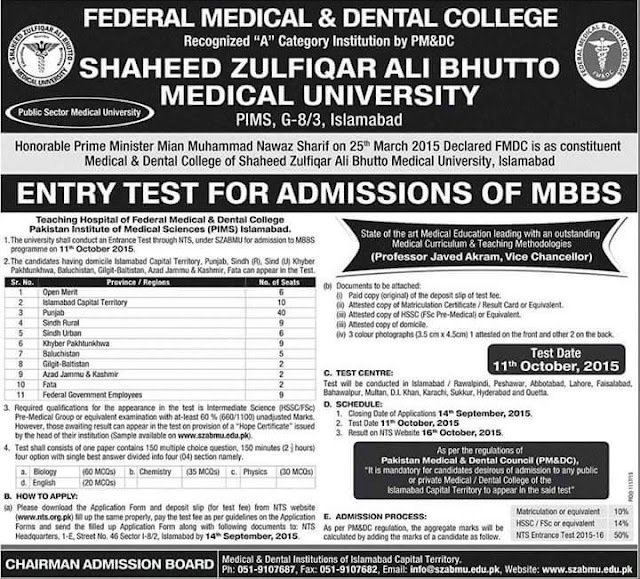 The merit criteria for FMDC is the same as the of UHS i.e 50% test, 40% fsc and 10% matric. You need to prepare the complete text books of Sciences for the test. The best source to prepare for the test ofcourse are your text books. Some helping books are also available in the market but that too contain the material from your course so it is better to read and learn from you course books. As per English you do not need any such preparation . If you are good at English you can do this portion easily. However you can practice the comprehension questions from the web. Revising grammar portion will be helpful too. The past papers will be added in a day or two.